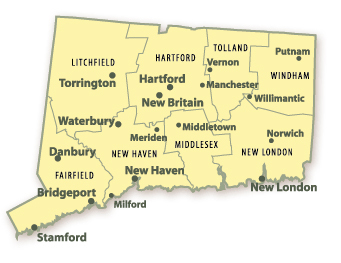 Council Members serve many areas in Connecticut. Click on the area links above, the map to the left, or scroll down to find help in your area. Families usually do not start their search in hopes to find the assisted living or independent living community with: the most citations or violations, the worst care history, or the highest staff turnover. But that is exactly what can happen when you request a list of assisted living options from other assisted living websites. A list of facilities is not what you are looking for! Elder Care Consulting's personalized services offer a unique comprehensive and flexible approach in meeting the needs of elders and their families. Our Elder Care Consulting Team, lead by a professional geriatric care manager, offers assistance with planning for future health care needs, finding reputable services, transitional senior moves, professional geriatric care management, home care services, assisted living program and counseling/family mediation. Nestled in a charming residential neighborhood just minutes from historic downtown, Atria Farmington is an assisted living community that offers discreet, 24-hour care.